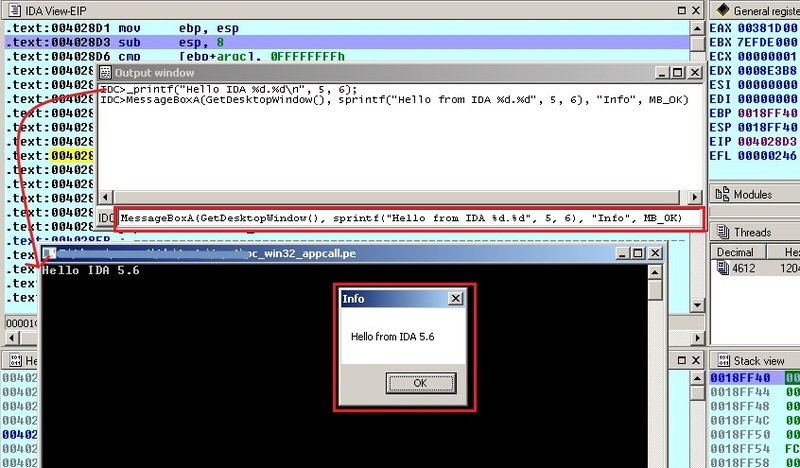 In this blog entry we are going to talk about the new Appcall feature that was introduced in IDA Pro 5.6. Briefly, Appcall is a mechanism used to call functions inside the debugged program from the debugger or your script as if it were a built-in function. If you’ve used GDB (call command), VS (Immediate window), or Borland C++ Builder then you’re already familiar with such functionality. Before diving in, please keep in mind that this blog entry is a short version of the full Appcall reference found here. //              - declaration string. example: "int func(void);"
// In fact there is rarely any need to call this function explicitly. // no IDC function with the same name. To pass function arguments by reference, it suffices to use the &amp symbol as in the C language. APPCALL_MANUAL: Only set up the appcall, do not run it (you should call CleanupAppcall() when finished). Please Refer to Manual Appcall section for more information. APPCALL_DEBEV: If this bit is set, exceptions during appcall will generate IDC exceptions with full information about the exception. Please refer to Capturing exception debug events section for more information. It is possible to retrieve the Appcall options, change them and then restore them back. To retrieve the options use the GetAppcallOptions(). Please note that Appcall option is saved in the database so if you set it once it will retain its value as you save and load the database.